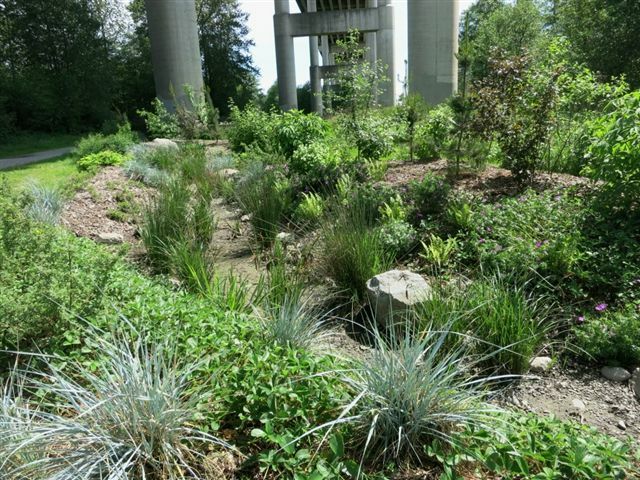 What’s Growing Under the Alex Fraser Bridge? When the South Fraser Perimeter Road (SFPR) opens in December, it will span 37 kilometres through Delta and Surrey with a four-lane expressway. Environmental mitigation is an important part of the project, and it comes in many shapes and sizes. It also attracts some very dedicated people. 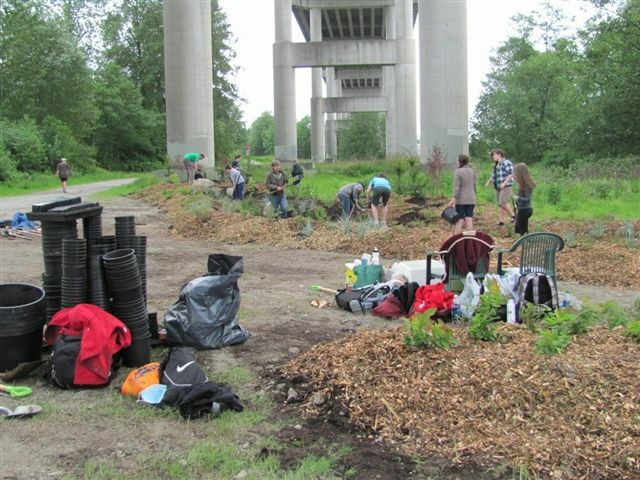 Students at Delta’s Burnsview Secondary School, led by their teacher Danick Benoit, approached the Ministry of Transportation and Infrastructure with hopes of volunteering their time to environmentally enhance an area on the south side of the Alex Fraser Bridge in 2011. Bringing in Cougar Creek Streamkeepers rain garden coordinator Deborah Jones for guidance, the group found inspiration by looking up. The idea: take advantage of water runoff from the bridge by building a rain garden underneath. The ministry, along with First Nations crews, began excavating and providing loads of soil for the students to start planting in May 2012. A year later, more than 1,100 plants and trees adorn two locations under and beside the bridge near Cougar Creek, on the south side of River Road. Vegetation at the two sites, named Fraser Falls Rain Garden and Tidewaters Rain Garden, includes a variety of native trees, shrubs, ferns, perennials, groundcovers, and wetland plants, says Jones. 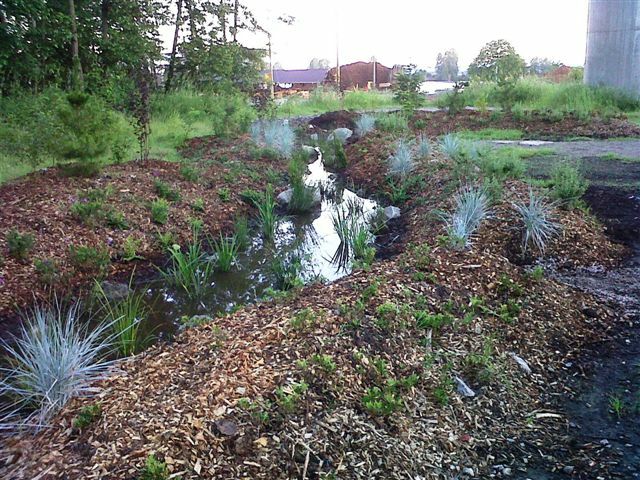 Aside from beautifying the area at the Delta Nature Reserve trailhead, the rain gardens provide habitat and move polluted water from impenetrable surfaces to the ground, rather than directly into the creek. Replenished groundwater that gradually seeps into the creek is important for the health of the creek’s inhabitants, such as spawning coho salmon and cutthroat trout. “In an urbanized area like North Delta, huge volumes of polluted rainwater runoff are piped directly from rooftops, streets and parking lots and straight into local creeks. Nature works just the opposite – rainwater soaks into the ground, where it’s cleansed and cooled as it seeps slowly underground toward our salmon streams,” says Jones. 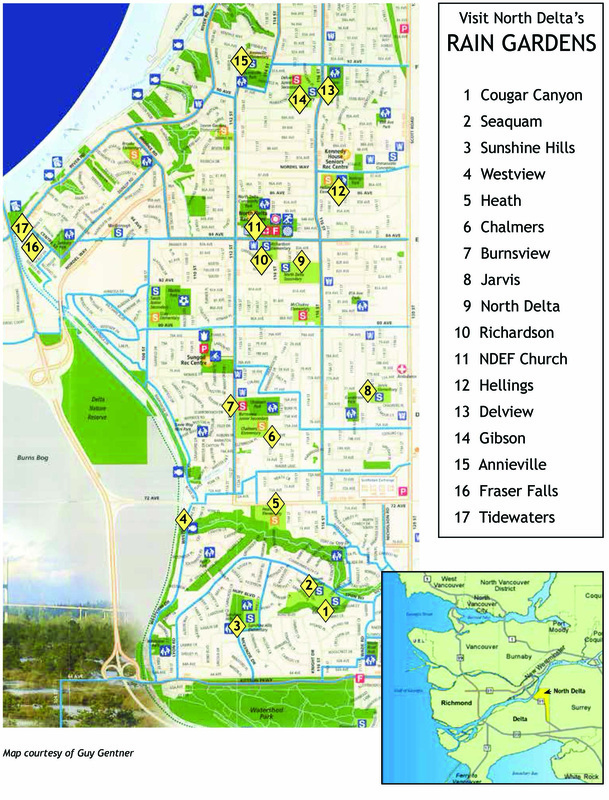 Cougar Creek Streamkeepers have coordinated the installation of 17 rain gardens around North Delta. In total, the gardens divert about 12 million litres of rainwater runoff from the storm sewer system per year, enough to fill about five Olympic-sized swimming pools. Is there a location in North Delta that you think could be improved by a rain garden? If so, feel free to connect with Cougar Creek Streamkeepeers. They’re happy to help. 2 Responses to What’s Growing Under the Alex Fraser Bridge? Thatbis very inspiring and deserves to be on the news and front page of th Vancouver Sun. Well done!! Wow,sense of care. Great community work. Special thanks to the Ministry of Transportation.